I arrived at the site of our newest rain garden on Tuesday morning and someone handed me a pry bar. Time to get digging. The asphalt was going to be harder to remove than we thought. 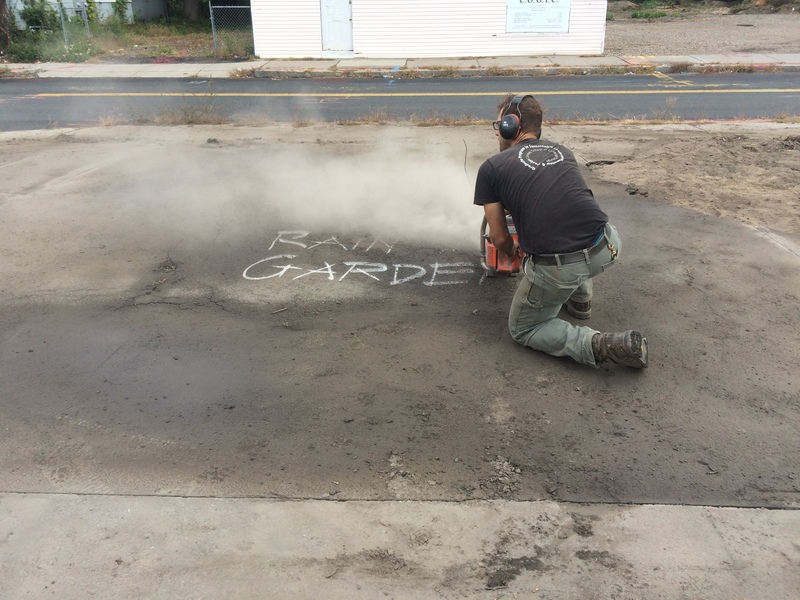 The rain garden we were preparing is part of the Springfield Rain Garden Project, (SRGP) that will build up to 10 rain gardens within the city to reduce combined sewer-overflows (CSO) that occur during storm events. CSOs are the largest source of bacteria pollution in the Connecticut River and a common problem in many cities with aging sewer infrastructure. 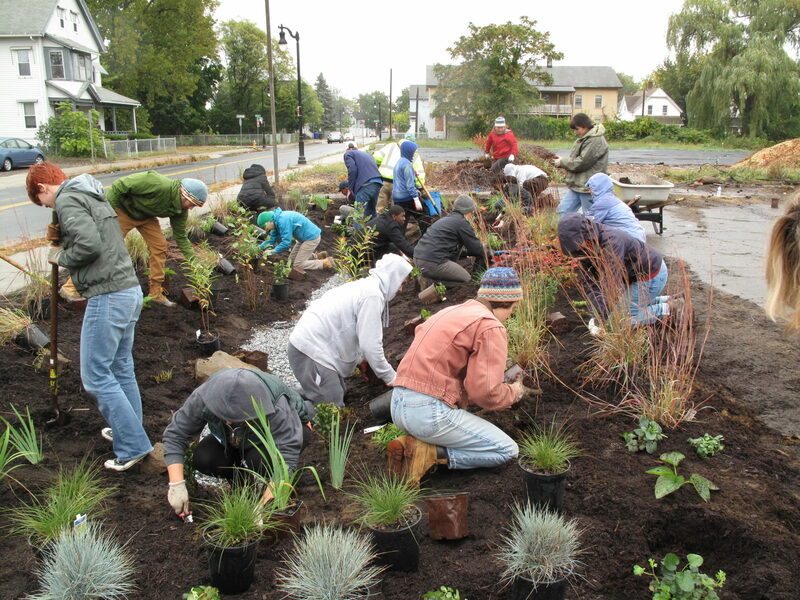 Rain gardens allow storm water to infiltrate directly into the ground, rather than run off into a storm drain, which reduces the negative impact of storm events on the city’s sewer system. This initiative is in partnership with the Pioneer Valley Planning Commission (PVPC), Clean Water Action, and Regenerative Design Group (RDG). 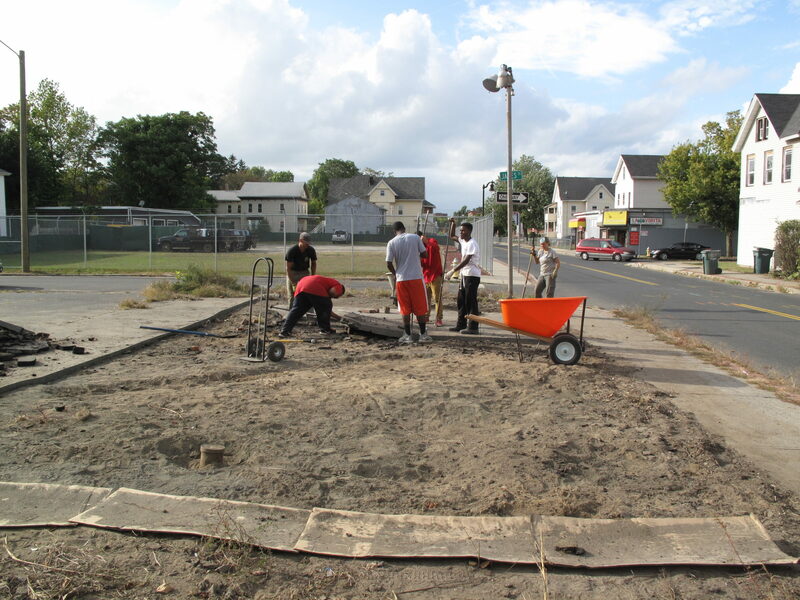 The Tuesday before planting day we arrived to prepare the garden area in the designated vacant lot on Walnut Street. With pry bars in hand, using bricks as fulcrums for our levers, we lifted up giant chunks of asphalt to reveal soil that had been hidden for at least 40 years. 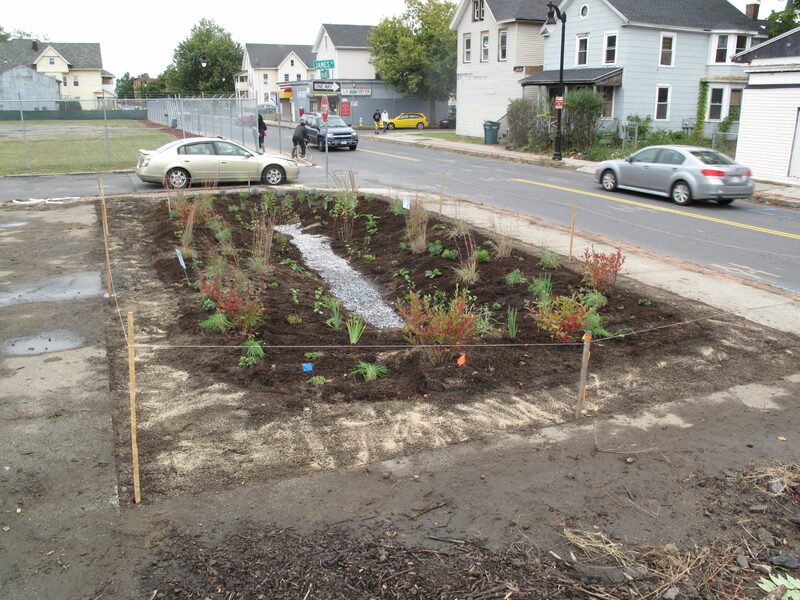 This rain garden, the third site for SRGP, is in collaboration with Gardening the Community (GTC) a ​youth-based urban agriculture organization that operates in​ the Mason Square neighborhood in Springfield and​ sustainably grows ​fruits and vegetables on ​formally ​vacant and abandoned lots. The garden is a part of GTC’s newest development on Walnut Street, where they are transforming two vacant lots into a 75-plot community garden, a six-stall parking lot, a small farm stand, and a 1,000 square foot rain garden. Rainwater will run off from the adjacent asphalt parking lot and farm stand area into the new rain garden, and infiltrate directly into the ground onsite. The garden has the capacity to hold 6,000 to 8,000 gallons of water, and based on the catchment area, this means it can manage 4-6 inches of rain in 24 hours. If there is any overflow during a major storm event, water will drain into the municipal sewer on the street. Preparing the site by removing the blacktop, shaping the garden, adding compost and soil amendments. After we removed all of the asphalt, it was time to shape the garden. 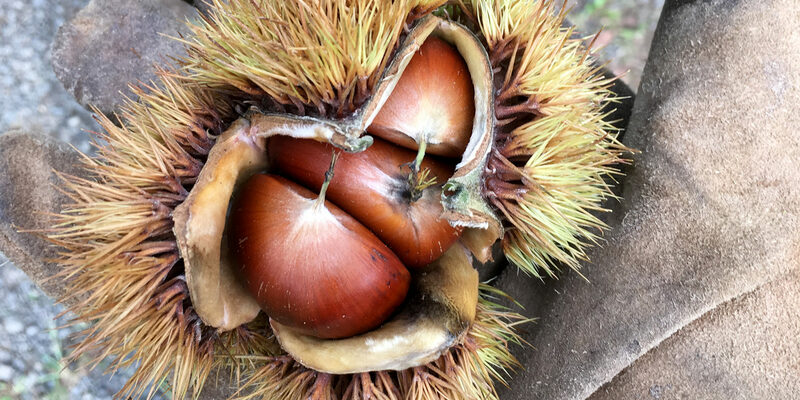 The gentle sloping basin will support carefully chosen perennial species that are tolerant of being inundated with water over short periods of time, and going without water for long periods of time. During our educational hands-on workshop on October third, we planted 150 plants ranging from butterfly weed, Asclepias tuberosa, to high bush blueberry, Vaccinium corymbosum. Students from the Conway School of Landscape Design, Smith College, members of GTC, friends and community members joined forces to complete the installation in less than one hour. 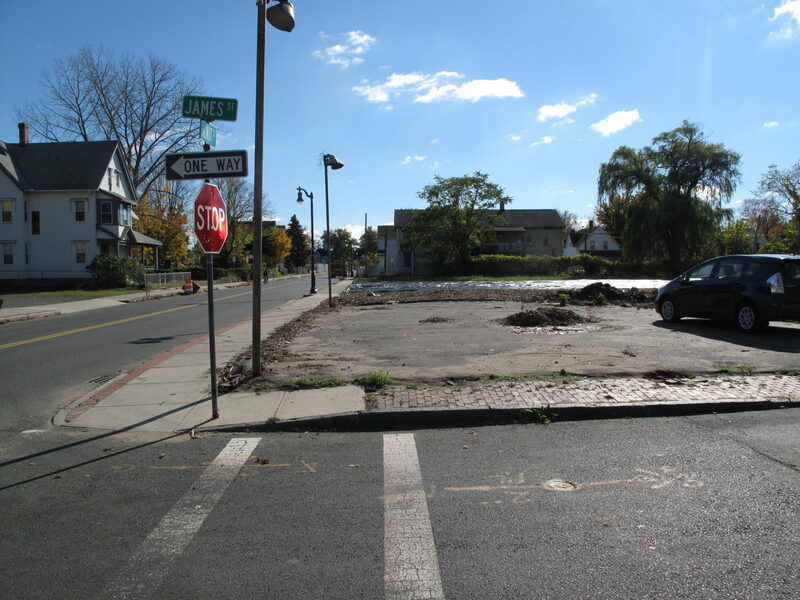 The Walnut Street lot will continue to transform as the community garden plots take shape next season, the rain garden has the opportunity to attract pollinators and will capture storm water, and the site becomes a new hub of activity for GTC and its community members in the neighborhood. This is so awesome! Depaving = ecological emancipation! “With pry bars in hand, using bricks as fulcrums for our levers, we lifted up giant chunks of asphalt to reveal soil that had been hidden for at least 40 years.” Love this image,of uncovering hidden sources of sustenance under all that asphalt. Awesome project, awesome blog, great title.